The likelihood of developing a serious disease grows steadily as we age. In order to remain in good health, it is essential to be aware of any physical changes or any signs that may indicate a problem, and to report these changes to our doctors as soon as possible. In 2017, the Centers for Disease Control and Prevention (CDC) reported that more than 30 million adults in the United States are currently living with diabetes. The many devastating effects of diabetes are well-known, in particular its connection with cardiovascular disease. Since the number one cause of death in the United States is heart disease, and diabetes greatly increases the likelihood of a heart attack or stroke, it is important to be able to recognize the symptoms of diabetes at the earliest possible stage. The CDC also stated in their 2017 report that more than 84 million adults in the United States are living with a condition known as prediabetes. Individuals with prediabetes have elevated blood sugar levels, but are not yet considered to be diabetic. 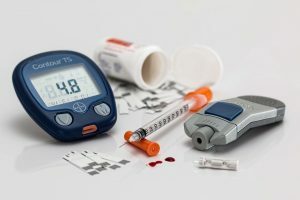 The CDC reported that individuals with prediabetes are likely to develop type 2 diabetes within five years unless they undertake proper treatment and appropriate changes in lifestyle. There are several early signs of prediabetes. Recognizing them early can mean the difference between a healthy life and a life spent dealing with the consequences of diabetes. When blood sugar levels are above normal, the kidneys try to remove excess sugar by filtering it out of the blood. This leads to frequent urination, especially at night. As mentioned above, frequent urination is the body’s way of removing excess sugar. The loss of fluid due to frequent urination causes dehydration. This, in turn, will cause an individual to feel more thirsty than usual. As an individual begins to develop diabetes, the body’s ability to transmit glucose via the bloodstream to the body’s cells becomes compromised. Since glucose is the body’s source of energy, a person with this problem will feel hungry throughout the day despite having recently eaten. Since prediabetes compromises the body’s ability to transmit glucose to the body’s cells, individuals with prediabetes are likely to feel a lack of energy, and a sense of fatigue. Excess sugar in the bloodstream causes damage to blood vessels in general, and in particular to the tiny blood vessels in the eyes. This damage can cause individuals to experience blurry vision in one or both eyes. It is well-known that uncontrolled or untreated diabetes is a leading cause of blindness. The blurry vision associated with prediabetes is an important early warning signal that it is time to consult with our doctor. As mentioned above, excess sugar in the bloodstream causes damage to an individual’s blood vessels and nerves, which in turn leads to leads to impaired blood circulation. Poor circulation increases the healing time required for cuts, wounds, and bruises. It also increases the risk of infection. High blood sugar levels damage both the blood vessels and nerves. A common side effect of this damage is a sensation of numbness or tingling in the hands or feet, a condition known as neuropathy. If we become aware of any of these symptoms, we should discuss them with our healthcare provider immediately. A simple blood test will determine if we are prediabetic. If we follow our doctor’s advice, taking the medications recommended and making appropriate lifestyle changes, it is likely that we will be able to avoid becoming diabetic. At Atlantic Coast Healthcare and Rehabilitation Center, in Lakewood, NJ, we pay close attention to the needs of our residents. Our restorative approach to senior health maximizew function and mobility in a positive and upbeat atmosphere.